Information received since the Federal Open Market Committee met in July suggests that economic activity is expanding at a moderate pace. Household spending and business fixed investment have been increasing moderately, and the housing sector has improved further; however, net exports have been soft. The labor market continued to improve, with solid job gains and declining unemployment. On balance, labor market indicators show that underutilization of labor resources has diminished since early this year. Inflation has continued to run below the Committee's longer-run objective, partly reflecting declines in energy prices and in prices of non-energy imports. Market-based measures of inflation compensation moved lower; survey-based measures of longer-term inflation expectations have remained stable. Consistent with its statutory mandate, the committee seeks to foster maximum employment and price stability. Recent global economic and financial developments may restrain economic activity somewhat and are likely to put further downward pressure on inflation in the near term. Nonetheless, the committee expects that, with appropriate policy accommodation, economic activity will expand at a moderate pace, with labor market indicators continuing to move toward levels the committee judges consistent with its dual mandate. The Committee continues to see the risks to the outlook for economic activity and the labor market as nearly balanced but is monitoring developments abroad. To support continued progress toward maximum employment and price stability, the Committee today reaffirmed its view that the current 0 to 0.25 percent target range for the federal funds rate remains appropriate. In determining how long to maintain this target range, the committee will assess progress _ both realized and expected _ toward its objectives of maximum employment and 2 percent inflation. This assessment will take into account a wide range of information, including measures of labor market conditions, indicators of inflation pressures and inflation expectations, and readings on financial and international developments. The committee anticipates that it will be appropriate to raise the target range for the federal funds rate when it has seen some further improvement in the labor market and is reasonably confident that inflation will move back to its 2 percent objective over the medium term. 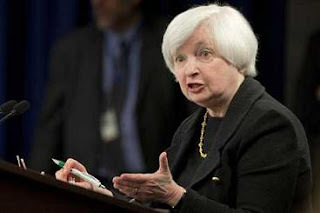 US Federal Reserve Chair Janet Yellen said Thursday rate move is still likely this year. The majority of Fed officials on the committee setting the federal funds rate _ which controls the interest banks charge each other _ still see higher rates coming before 2016. Federal Reserve policymakers have slightly lowered their projections for growth and inflation in the next two years, an outlook that likely factored into their decision to hold off on raising interest rates. The Fed on Thursday also reduced its estimate for long-run unemployment to 4.9 percent from 5 percent. This suggests that it is willing to wait for unemployment to fall further before cutting rates. Unemployment stands at 5.1 percent. And Fed policymakers now see just one rate move likely to take place this year, down from two in their previous forecast in June. The Fed now expects that its preferred measure of inflation to rise only by 0.4 percent this year, down from 0.7 percent in June. Both are far from the Fed's inflation target of 2 percent. The Fed's downgrades to its forecasts for growth and inflation weren't large. It now foresees the economy expanding at just a 2.3 percent pace next year, down from June's projection of 2.5 percent. It predicts that inflation will reach 1.7 percent in 2016, just below its previous estimate of 1.8 percent. When the Fed does start to raise rates, policymakers see very slow increases: Just one-quarter of a percentage point this year, followed by 1 percentage point in 2016 and 1.25 percentage points to 2.63 percent in 2017. One US Federal Reserve policymaker believes zero interest rates are not low enough and is calling for rates to go negative. The official wasn't identified in materials the central bank released Thursday. 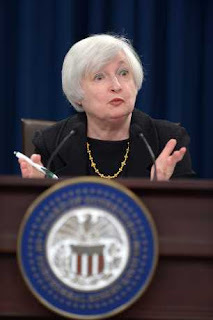 But the likeliest suspect is Narayana Kocherlakota, president of the Federal Reserve Bank of Minneapolis. The Fed has kept the rate it controls near zero since December 2008 and passed up a chance to raise it on Thursday. Still, many economists expect a rate hike later this year. A Federal Reserve rate move likely would have pushed the US dollar higher on foreign exchange markets. A strong dollar makes US products more expensive overseas. A dollar is already up more than 15 percent against major currencies over the past year. And US factories are hurting. The Institute for Supply Management reported earlier this month that US manufacturing grew last month at the slowest pace since May 2013. The Federal Reserve Bank of New York reported this week that factory activity in New York state fell in September for the second straight month. Factories cut 17,000 jobs last month, biggest drop in manufacturing employment in more than two years. Strange as it sounds, the social justice movement is united with Wall Street in opposition to a Federal Reserve rate move. Protesters clad in green t-shirts rallied outside Fed offices. They hoisted signs that linked monetary policy with the racial disparities behind the “Black Lives Matter'' movement. “Black America is still in a Great Recession,'' read one sign. “Don't raise the interest rate,'' the group collectively chanted, arguing that the Fed will eventually encourage faster wage growth by holding rates at the near-zero level they have been at since late 2008. The group is questioning the presence of inflation in the economy _ since rising prices have historically triggered rate moves. The US Federal Reserve is keeping interest rates at record lows in the face of threats from a weak global economy, persistently low inflation and unstable financial markets. Fed officials said Thursday (early todaq HK time) that while the US job market is solid, global pressures may “restrain economic activity'' and further drag down already low inflation. Signs of a sharp slowdown in China have intensified fear among investors about the US and global economy. And low oil prices and a high-priced dollar have kept inflation undesirably low. “All this really does is punt,'' said Scott Clemons, chief investment strategist for Brown Brothers Harriman's private banking business. Wall Street's early reaction to the Fed's decision, which investors had widely expected, was muted. US stock indexes were up slightly and roughly where they were before the Fed released its policy statement at 2 p.m. Eastern time. The Fed's action was approved on a 9-1 vote, with Jeffrey Lacker casting the first dissenting vote this year. Lacker, president of the Fed's Atlanta regional bank, had pushed for the Fed to begin raising rates by moving the federal funds rate up by a quarter-point. Instead, the Fed retained language it has been using that it will be appropriate to raise interest rates when it sees “some further improvement in the labor market'' and is “reasonably confident'' that inflation will move back to the Fed's optimal inflation target of 2 percent. In an updated economic forecast, 13 of the 17 Fed policymakers said they see the first rate move this year. In June, 15 Fed officials had predicted that the first rate hike would occur this year. The new forecast significantly lowered the expectation for inflation this year to show the Fed's preferred inflation gauge rising by just 0.4 percent, down from a mere 0.7 percent forecast in June. The change takes into account the further rise in the value of the dollar, which makes imports cheaper, and a recent drop in oil prices. The Fed's forecast still foresees inflation accelerating to a 1.7 percent increase next year, still below its 2 percent target. Hong Kong and Shanghai stocks ended the morning session higher, in line with a rally in most Asian markets, after the Federal Reserve held off an interest rate move. The Hang Seng Index added 0.42 percent, or 92.10 points, to 21,946.73 by the break. And Shanghai's composite index added 0.40 percent, or 12.22 points at 3,098.28. The Shenzhen Composite Index, which tracks stocks on China's second exchange, gained 0.51 percent, or 8.54 points at 1,666.96. The US Federal Reserve opened the final day of deliberations on a crucial interest rate decision but hours before its announcement stocks in Asia, Europe and on Wall Street pulled back. After locking its benchmark interest rate at zero percent for nearly 7 years, the Fed must decide whether the US and global economies are strong enough to weather a modest move. Ahead of the meeting, China stocks including shares in Hong Kong pulled back, European stocks including London’s FTSE lost ground, and in the US golf futures retreated Thursday. The Dow Jones Industrial Average, S&P 500 and the Nasdaq Composite all retreated at the open today. Supporters of an increase say the US economy has gained enough strength to begin moving the Fed away from its extraordinary crisis-era policy of easy money to a more normal policy stance. But so-called rate doves say the economy, and especially the labor market, still display weaknesses and that the global slowdown poses risks to the US that merit keeping the federal funds rate where it has stood since 2008, at 0-0.25 percent. British retail sales increased in August from the previous month, boosted by keen demand for school uniforms ahead of the new academic year, official data showed. Sales by volume gained by 0.2 percent last month compared with July, the Office for National Statistics said in a statement. The ONS added that retail sales grew by 3.7 percent in August compared with one year earlier. “UK retail sales continue to grow in 2015 but the figures show that growth is coming evenly from both small and large retailers,'' said ONS head of retail sales statistics Kate Davies.